Over 100 people have been injured and almost 300 arrested in Paris after violent clashes between police and "yellow vest" protesters, in a third weekend of nationwide demonstrations against high living costs. Police said they had arrested almost 300 people while 110 were injured, including 20 members of the security forces. French media have said a number of metro stations have been shut due to the violence. "We are attached to dialogue, but also respect for the law," Prime Minister Edouard Philippe told reporters. 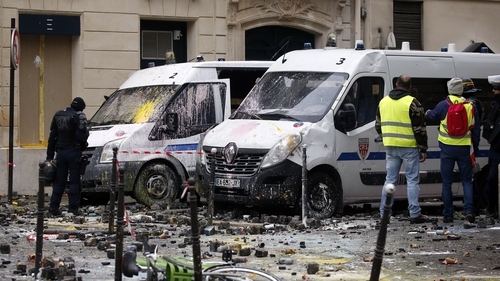 "I am shocked by the attacks on the symbols of France." The French president, who is at the G20 leaders summit in Argentina, said on Tuesday he understood the anger felt by voters outside France's big cities over the squeeze that fuel prices have put on households, but insisted he would not be bounced into changing policy by "thugs". Other protests were taking place around France by people angry over a surge in fuel prices this year which they attribute to a series of tax increases to finance the government's anti-pollution efforts. "With all these tax hikes, there's not much left for eating at the end of the month," Philippe, a school cook in the Essonne region outside Paris, said near the Champs-Élysées. The protests come a week after violent clashes on the avenue last Saturday, marked by burning barricades and vandalism which Mr Macron compared to "war scenes". The "yellow vest" movement erupted on social media in October and has since become a wider protest against Mr Macron, who is accused of failing to recognise the rising costs of living that has left many struggling. "We want our dignity back and we want to be able to live from our work, which is absolutely not the case today," Jason Herbert said after walking out of talks with Prime Minister Philippe on Friday. Trade union leaders, who met yesterday with Mr Philippe, have called for a moratorium on January's tax hike, a suggestion which some pro-Macron members of parliament have started to endorse. The movement has also spilled across to neighbouring Belgium, where riot police used water cannon yesterday to disperse stone-throwing "yellow vest" protesters who burned two police vehicles in the centre of Brussels.